I provide tech support, training, and consulting on a number of RockWare programs, including RockWorks, LogPlot, Surfer, Grapher, Didger, QuickSurf, WellCAD, and others. The Arizona State University team overseeing the imaging system on the NASA Lunar Oribiter (LRO) has released a high-resolution color shaded relief map of the far side of the moon. The Denver Post recently reported that Anadarko estimates between 500 million and 1.5 billion barrels of oil remain in the Wattenberg field in the Denver-Julesburg Basin in Colorado, thanks to the success of their horizontal drilling and fracing completion techniques in the Niobrara formation. Their first 11 wells started out with an average production of 800 BOPD. Anadarko plans 1200 more wells in the Niobrara with TD’s below 6000′. The Denver Post recently had a pretty well-balanced article about fracking. The article explains that the problems occur if the surface casing is not cemented properly, and the fracking procedure includes pressuring up the borehole to make sure the cement holds. Often the problems are caused by surface spills and older wells that do not have cement jobs up to current day standards. Lithlogy columns are offset from the borehole "axis". 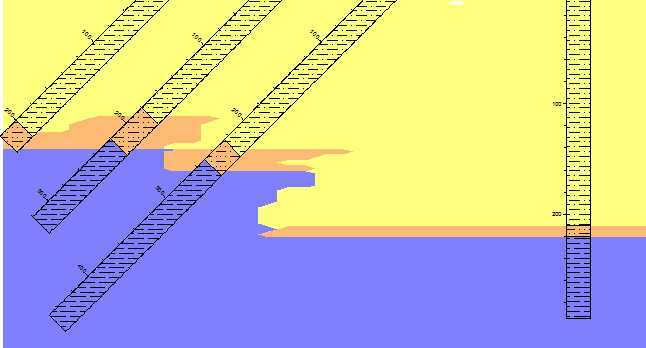 In this post I relate some issues that occur when working with lithology profiles with inclined boreholes and offset lithology columns posted with the boreholes. 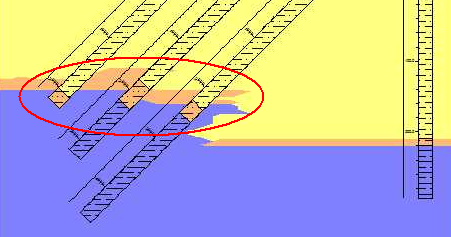 For this type of profile, the Axis line is where the borehole is aligned with the model, so the lithology column position needs to be changed to be centered on the Axis line. 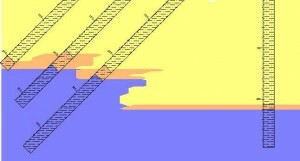 The example illustrates a lithology profile drawn through several inclined boreholes. At first glance, the lithology in the model (solid color) does not match the lithology in the inclined boreholes (color + pattern). The profile has a Depth track to the right of the Axis line, and a Lithology column even further to the right of the Axis line. 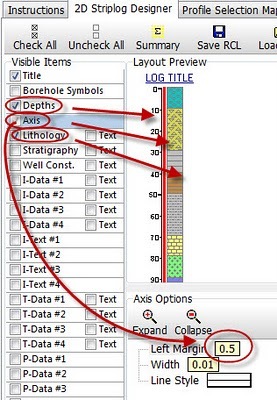 When I draw a red line from the contacts in the Lithology column onto the Axis line, you can see that the model honors the borehole data along the Axis line. Red lines projected from the Lithology column to the Axis line show the location of the lithology on the model. For one final tweak, change the offset of the columns to have the Axis line plot behind the center of the Lithology column. On the 2D Striplog Designer tab, drag the Depths track to the farthest left side of the Layout Preview, drag the red Axis line to the middle position, and drag the Lithology column to the right position. In this case the width of the Lithology column is set to 1.0, so set the offset of the Axis Left Margin by 0.5, and offset the Lithology column by -0.5. Move the Depths and Lithology columns, then change the Lithology Left Margin value. With the Lithology column centered on the Axis, the boreholes are aligned with the model.